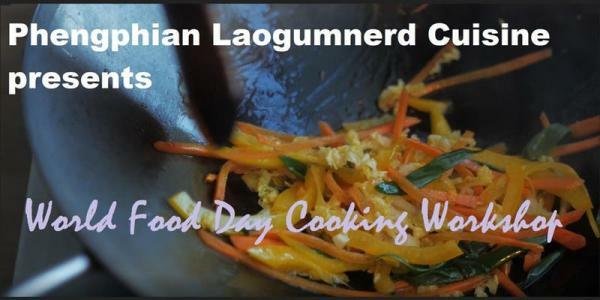 Phengphian Laogumnerd Cuisine, organizer of the new World Food Day Cooking Workshop, announced that the event will be held in Brooklyn on Tuesday, October 16th. Foodies looking for the latest information on how to cook Asian food affordably and sustainably can register to attend the World Food Day Cooking Workshop scheduled for Tuesday, October 16th. Significance of World Food Day and its mission – discover what World Food Day is and when it started while also learning the issues it is trying to draw attention to, notably food security, and how to address them. Since 1945, World Food Day has been taking place every year and its impact continues growing. Affordable cooking – learn how you can cook your meals in a much more affordable manner by following the simple but delicious recipes that Phengphian Laogumnerd Cuisine proposes. Making restaurant quality food does not have to be costly and this event seeks to emphasise that point. Participants will have the opportunity to observe a real professional while also themselves trying out their cooking skills. Sustainable living – discover more about the origins of your food and which retailers you should patronise in order to have a more positive impact, while also discovering more about vegan and vegetarian Asian cuisine. Sustainability is a growing concern particularly as the world’s population grows and more food is required to feed it. Finding more sustainable models to co-exist, particualrly with regards to sourcing food, is imperative. Full details on the event can be found on the Eventbrite event page which can be found at: https://www.eventbrite.com/e/phengphian-laogumnerd-cuisine-world-food-day-cooking-workshop-tickets-49949834299. There you can also register to attend. World Food Day is an appropriate time to draw attention to the extremely pressing issue of food security. To that end, Phengphian Laogumnerd Cuisine is organising the event free of charge for those wishing to attend (number of places is limited, however). Furthermore, the event will have a particular focus on sustainable and affordable cooking approaches, particularly looking at some tasty vegetarian and vegan dishes from Asia. Phengphian Laogumnerd Cuisine is a multi-service cuisine company from New York City, specializing in Asian Fusion food. It offers a wide range of services like catered events as well as cooking classes. Industry leading catered events are at the core of their operations. They specialise in Asian fusion food, with a focus on experimentation. The company constantly looking to experiment and bring you something new and exciting with its dishes. Founded in 2000, the company is developing at breakneck speed and constantly innovating in one of the most exciting cities in the world. Interested parties can visit the website at: https://www.phengphianlaogumnerdcuisine.com/.